Also, April 27th, 2019 will be a free dump day for Lawrence County. Tim Spencer, Lawerence County Transportation Dept. rep explained the steps the county is taking to try to get roads repaired. 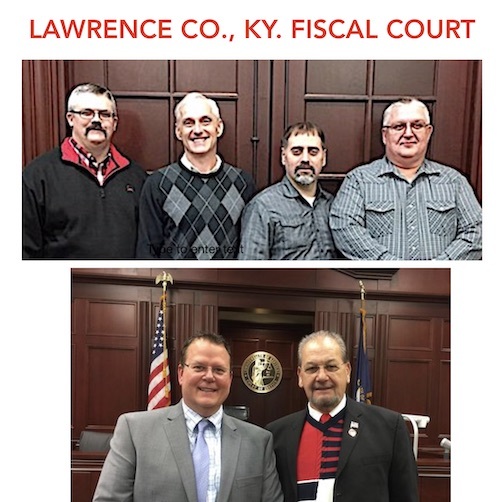 LOUISA, KY. — Lawrence County Fiscal Court Meeting was held on Tuesday, March 19, 2019 starting with the opening prayer, pledge of allegiance and then called the meeting to order. Approval of the minutes from the Feb. 19, 2019 meeting was motioned by District Three Magistrate, David Pinson; seconded by District Four Magistrate, Rick Blackburn. Approval of the 1st Reading of Budget Amendment #5 motioned by District Four Magistrate, Rick Blackburn; seconded by District Two Magistrate John Scaggs. Approval of Treasurer’s Request motioned by Distract Four Magistrate, Rick Blackburn; seconded by District One Magistrate, Michael Halcomb. Approval of Bills was motioned by Distract One Magistrate, Michael Halcomb; seconded by District Three Magistrate, David Pinson. Approval of Treasurer’s Report was motioned by District Four Magistrate, Rick Blackburn; seconded by District One Magistrate, Michael Halcomb. Approval of Ky. Transportation Cabinet District 12 Rural Secondary Program was proposed by Tim Spencer, of the Lawrence County Highway Transportation Department. Mr. Spencer proposed repaving or laying asphalt in three different locations in Lawrence County. The approval was passed motioned made by District One Magistrate, Michael Halcomb; seconded by District Three Magistrate, David Pinson. 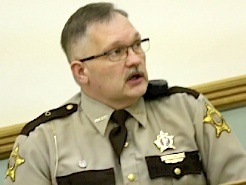 Approval of Outgoing Sheriff Garrett Roberts 2018 Fee Settlement & Excess Fees of $173,729.75 was returned and accepted to Fiscal Court. Motion made by District Three Magistrate, David Pinson; seconded by District Four Magistrate, Rick Blackburn. Approval of Outgoing Sheriff Garrett Roberts 2018 Property & Franchise taxes Settlement in the amounts of .5 cents and .6 cents was approved and motion made by District Three Magistrate, David Pinson; seconded by District One Magistrate; Michael Halcomb. Approval of forming a Personnel Committee was passed motion made by District Three, David Pinson; seconded by District One Magistrate, Michael Halcomb. Approval of Proclamation Naming May 2019 as Building Safety Month was approved. Motion made by District Four Magistrate, Rick Blackburn; seconded by District One Magistrate, Michael Halcomb. Approval of Resolution Naming April as Fair Housing Month was approved by District One Magistrate, Michael Halcomb; seconded by District Four Magistrate, Rick Blackburn. Appoint Member to Fivco Regional Development Planning Committee was approved and motion made by District One Magistrate, Michael Halcomb; seconded by District Three Magistrate, David Pinson. Advertise for Surplus (Chipper) starting bid at $10,000.00 was approved and motion made by District Four Magistrate, Rick Blackburn; seconded by District One Magistrate, Michael Halcomb. Approval for County Clerk to Advertise for Fema Steel Sites was approved, and motion made by District Three Magistrate, David Pinson; seconded by District Four Magistrate, Rick Blackburn. 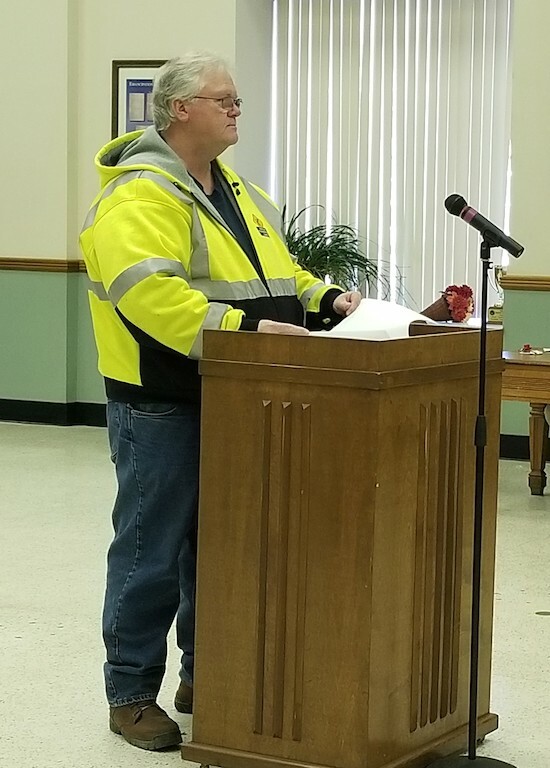 During Public Comments: The sanitation division director Jim Burchett provided the court with a report that there had been three trips to Frankfort for training and to get grants approved. There have been three illegal dumps caught and citied for illegal dumping and 5 verbal citations to which the dump areas were cleaned back up and dumped properly. Beware if you do dump illegally the County will take the time and try to find whose responsible and hold them accountable, Burchett said..
County Attorney, Mike Hogan proposed not to vote on the Legend Outfitter’s Contract until April giving the court ample time to review the Competition Clause in the Contract. County Judge Executive, Phillip Carter agreed stating, “On the 32 side of Yatesville he planned on opening up a store and the mini putt putt, but if he also desired would like to be able to rent kayaks without it being considered competitive and would like that to be clear in the contract.” And this was passed by MOTION OF District Three Magistrate, David Pinson; seconded by District Two Magistrate, John Scaggs. The adjournment was motioned by District Four Magistrate, Rick Blackburn; seconded by District One Magistrate, Michael Halcomb. I agree the city roads need worked on too. Old lick creek rd behind the louisa middle school needs to.be paved and some speed bumps on the road. People think it’s a place to speed and there is kids that play and run on this road for the school. Well just goes to show you that Sheriff Roberts ran a good financial ship and the money he turned over can help the county out in many areas. Roberts never was one to just go around spending money on unnecessary things. Bet that you won’t see the new administration run as good of an operation and budget as Roberts did. Happy Retirement to you Sheriff Roberts….You did great things for Lawrence County and will be missed. That is pretty stupid. You have to spend money to run a department and make it grow. Wouldn’t have taken much of that 173k to get a K-9 unit and give the deputies a raise. No raise in 7 years is just wrong. So glad this new administration is doing the right thing. The 173k is going to be used in the county somewhere. Using it to protect and serve Lawrence Countians makes more sense than turning it in to try to look good. When will the county enforce the mandatory garbage pickup? When will the county enforce littering laws? When will the county go out and simply take a look at all the garbage being thrown over the creek banks that are owned by the ones throwing it over? What about the piles of garbage piled up on the edges of property waiting for the next flood to take it away “accidently”? What about all the residents that burn their garbage on creek banks and the letting the next flood take what remains away? Take a drive on the county roads and simply take a look along the ditch lines at the amount of garbage. Enforce the county law on garbage pickup!!!! !